Every time I install a new version of SSMS I make a handful of changes to the default setup. For my own notes, and in case anyone is interested in some of the things you can do with SSMS I thought I’d post a list of those changes. Move the Object Explorer, Solution Explorer, Template Browser and Registered Server views to the far left as tabs. A little while back I read a post by Aaron Bertrand (b/t) about how he uses a darker set of colors for the query windows. I tried it and liked it quite a bit better. Currently I’m using Doug Holland’s version (also mentioned in Aaron’s post). 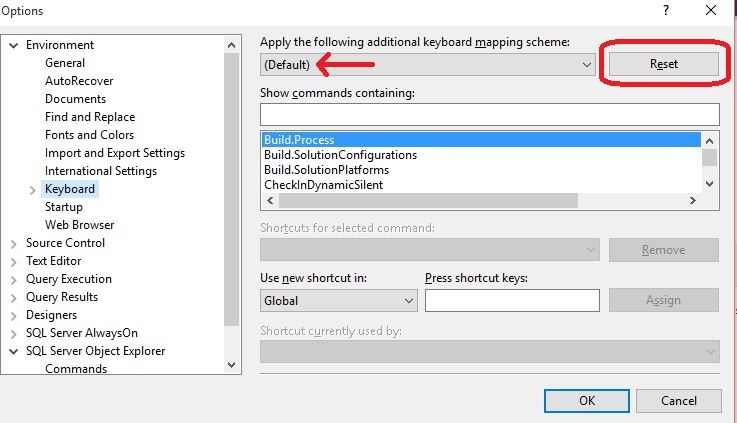 Reset the keyboard shortcuts to default. Newer versions of SSMS don’t start out with the set of shortcuts I’m used to. This is easy enough to fix by resetting them to the default. I frequently re-use the same query window, so I change connections a lot. It goes a lot faster since I mapped it to a shortcut. Change the At Startup setting. 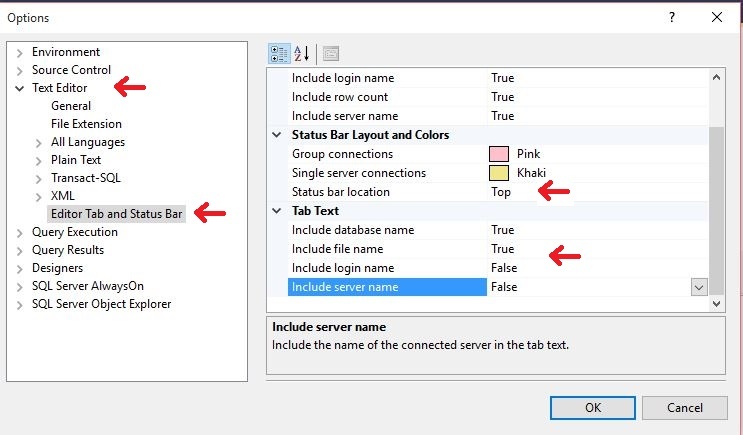 This setting let’s you pick what type of connection gets opened when you first open SSMS. So you can have Object Explorer open, a New Query open, both or neither. My preference is neither. I add the statement RETURN at the top of any new query that I open. At work we use a Central Management Server to keep a shared list of all of our active instances. Obviously when I install a new version of SSMS I need to connect to it. I need to register my local instances since they aren’t going to be in the CMS. I collect a fair number of scripts and write even more. Using project(s) helps me keep them organized. Set the scripting option to the version of SQL I most use. I like to use the latest version of SSMS. Unfortunately these days that means I’m working with a version of SSMS that is sometimes 3 or even 4 versions ahead of the version of SQL Server I’m connecting to. If I want to use the scripts SSMS is going to generate for me I need to tell it what version of SQL I’m scripting for. 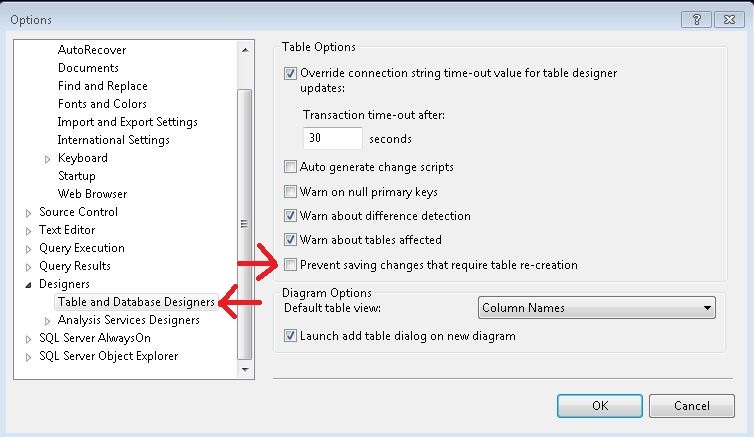 By default the table designer won’t let you save changes to a table if it thinks it needs to create a new table & copy the data over. For example when you need to add a column into the middle of the table. Since this is one of the places I use the SSMS GUI by preference (over scripting) It’s nice if it works. I also like to add line numbers (Options –> Text Editor –> All Languages –> Line numbers) to the query view. Not a bad idea 🙂 Thanks for mentioning it! I use Paul Randal’s suggestions here: http://www.sqlskills.com/blogs/paul/configuring-ssms-for-presenting/ – it has some of the same ideas (including line numbers) but you have good points too – thanks! Absolutely. The main difference is that his is specifically for presenting while mine is day to day use. I actually have two separate installs of SSMS (one 2016 & one 2014) on my home computer that have different setups. One for presenting and one for general use. I like that one. I may have to add that myself. I use :connect on a regular basis.